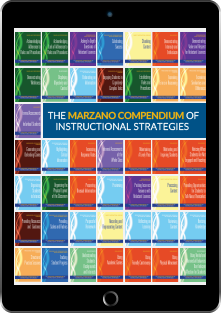 The Marzano Compendium of Instructional Strategies is a resource for teachers, instructional coaches, teacher mentors, and administrators. This online resource presents 332 strategies related to the 43 elements of Dr. Marzano’s updated Art and Science of Teaching framework. You will gain access to videos explaining the elements and concepts presented, 43 downloadable PDFs, scales to help implement the learning goals, and so much more! The Compendium is a convenient, easy-to-navigate, and affordable resource that is available for a yearlong subscription. The Marzano Compendium of Instructional Strategies is a comprehensive, research-based collection of essential learning resources designed to boost classroom instruction. Complete the form to get your free preview of one of the 43 practical resources included in the Compendium.